I have to dance. I do not think I could manage school, or much of anything else in fact, without dance. 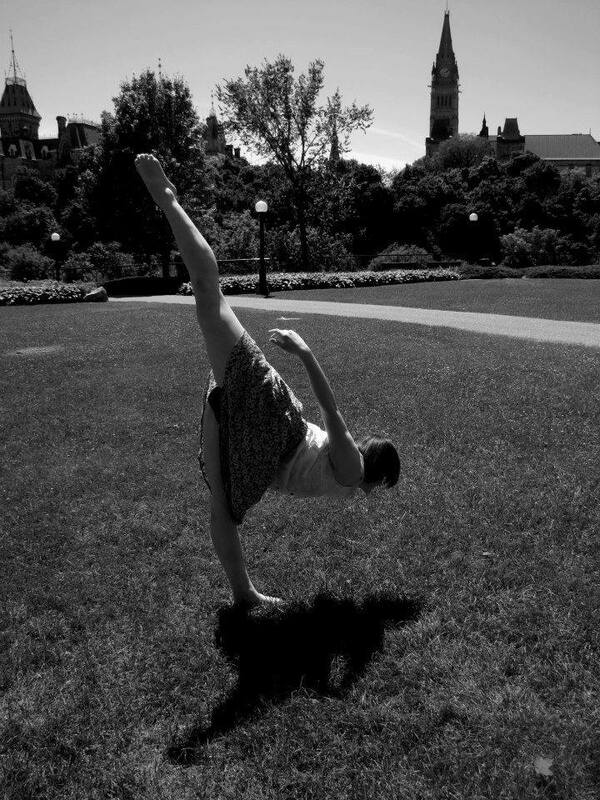 Unlike Erin, who calls herself a kinaesthetic thinker, I dance to get away from my thoughts and out of my head. Dance is the only thing I have ever found – except perhaps film – that allows me this reprieve. And as someone who struggles with anxiety, depression, and perfectionism, it is both a welcome and necessary reprieve. I said I would dance anywhere. That includes near Parliament Hill! When I talk about dance, unless I am referring specifically to my time inside a studio rehearsing a piece or working on my technique, I am usually speaking about improvisation. Though I enjoy these other aspects of dance, and recognize they are necessary to expanding my control over my body, and consequently, my ability to express myself as limitlessly as possible, I find the most solace in improvisation. Give me a dark room and some music, and my body takes care of the rest. I will dance just about anywhere – from airports to parking lots, to between bookshelves in the library, in my room, and, of course, at dance studios. When I begin to panic and feel like my world is spiralling out of control, getting up and starting to move, with or without music, in any space, grounds me in my body. As someone whose mind is usually either stuck ruminating on the past, or else is speeding off into the future, dance draws me back into the present. I have been filled by some of the purest joy while dancing, but have also turned to dance when I am too numb to feel anything else. I often process my emotions, or at least allow myself room to feel them, through dance. Ironically, I have both school and my perfectionism to thank for my years of training. Upon realizing that dance classes were perhaps the only things that would keep me from studying, over time, my parents gradually gave in to more classes, more workshops, and more competitions – anything to get me away from my textbooks. It was even thanks to my grade eight math teacher that I ended up at my high school where I studied dance. My parents were anxious to get his advice during a parent-teacher interview on where I might thrive most after middle school. As the story goes, he ignored their questions about IB and gifted programs, and instead asked if they had considered letting me go to an arts high school for dance. I have felt indebted to him ever since. I have on occasion attempted to bring my love of dance into the classroom, and not infrequently use it as a frame of reference when trying to grasp new concepts. When we talk about gender roles, my mind inevitably turns to the tradition of ballet, which firmly relegates males and females to different choreographic parts. When we discuss sexualisation, my thoughts turn to the alarming sexualisation of young children – mainly female – at dance competitions. When my sociology of education classes feel hopeless, I try to think back to my experiences of attending an arts high school, and I am reminded that there are alternative ways of approaching education. I had a field day with my first aesthetics class in philosophy. I leaped at the opportunity to relate every assignment back to dance, which eventually led to me taking on an independent study on the aesthetics of dance. Though I enjoyed the independent study, I quickly realized that dance for me exists outside of the realm of the written word. My professor pointed out that my papers were riddled with unsubstantiated claims – but everyone can dance! We are born dancers! – and I learned that having the privilege to experience dance is enough for me. I do not want to try to capture something so elusive, magical in its nebulousness. Scrutiny can undermine sanctity. This summer my psychologist told me to make a list of all of my commitments I had signed up for during the school year. She instructed me to choose three to keep for certain, and to rank the rest in order of how much they would increase my stress and decrease the quality of my work. I tried to argue that my dance classes should not count as one of the three guaranteed commitments, because, like Gillian, who makes time for roller derby despite her packed schedule, dance is a given in my life. I simply don’t function without it. I take as many dance classes as I can, and have taught and choreographed dance for years. When I am asked what I do for fun (the list is scant), I sometimes forget to list dance because it is such an integral part of my life and identity that I do not see it as a hobby. When I improvise, I feel seen, known, and understood. Improvising leaves no room to premeditate, no time to plan, curate, or refine the image you want to portray. This stands in stark contrast to my imposter syndrome and general insecurity, both of which cause me to feel like I am constantly “faking it”, and have yet to be found out for the (inadequate, terrible) person I really am. Being able to return to my body and know that embedded within it is an authentic version of myself is a blessing. Further, no one has ever been able to figure out why I approach everything in my life but dance with unceasing perfectionism. Somehow I have managed to reserve this one space in which I am allowed to simply be, and to enjoy myself. Though this is not the case for many dancers, especially those attempting to make a professional career out of dance and often those studying ballet, I am thankful to say my dance remains perfectionism-free. If you read this, and thought to yourself, “I wish I could dance,” please know that you can. Everyone can dance. I truly believe it is only socialized inhibitions, and perhaps in some cases, the limits and abilities of our bodies, that prevent us from dancing as we age. So turn off the lights and turn on your favourite song. And if you have a child and the means to do so, consider enrolling them in a dance class. You never know, you or they might just be someone who has to dance too. My dance playlist is always evolving, but here are some songs that have stuck with me over the years (as well as a few that I am enjoying too much right now not to include). There are, though, some pretty fantastic ballet troupes beginning to play with gender bending, like Les Ballets Trockadero de Monte Carlo. Check this video out.